"She’s going to have to get in," I overheard my training partners, Paula Harris and Danny May, say as we watched Camden quit on a long water retrieve one April afternoon. 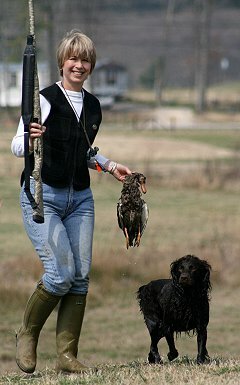 I had seen this behavior from Camden before; in her first Boykin Spaniel Society Upland she failed to complete her novice and intermediate water retrieves, and in three separate started tests she completed on land and failed on water. My reverie of past failures ended with a jolt when I realized that the one who was "going to have to get in" was me. I can’t swim. Those early childhood swimming lessons in a frigid pool included putting my face under water, and I never got over it. I’m also not fond of water too murky to see my feet, and that includes every lake, pond, stream or river in which I’ve trained my boykin girls. We thought we had this problem licked. 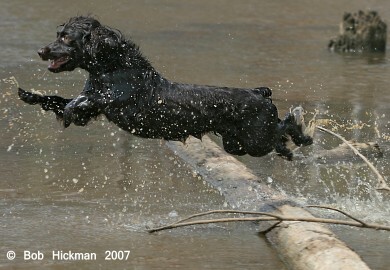 After our failures in January and February, we prepared for the Boykin Spaniel Society Spring National by training in a new or different pond every week. Trying to find a common denominator for success, we set up long retrieves in small ponds and short ones in big ponds. Camden is the fourth dog in our household and the youngest in our pack. We attributed her sometimes timid behavior in water to her submissive nature or an occasional blond moment. At least it wasn’t her mother Edie’s "talk to the paw" attitude. Surely by introducing her to a variety of new water training environments we would build her confidence. Our training approach appeared to have paid off as we watched her leap confidently into the water at the Boykin Society National Field Trial. Both water series in the novice class were challenging, but Camden plowed through marsh grass, lept over fallen trees and climbed atop floating logs in the quest to bring back her ducks. Surely, we had this problem licked. As I steeled myself for the prospect of a swim in the farm cattle pond and the hour long drive home, we devised a game plan. It was simple; we would throw an easy mark and if Camden quit and turned for the bank, we would meet her in the water and take her to the mark. Watching Danny strip off his socks and crocs, I realized that my pink polka dot garden clogs would probably have to go, too. Cow ponds... do you know how the bottom of a cow pond feels as it squishes between your toes and covers the tops of your feet? While Danny and I were preparing to take the plunge, Paula raced to get her cell phone to capture the moment. What are friends for? With Danny behind me, I heeled Camden to the water’s edge and signaled for the mark. Camden watched attentively, released on command and swam out about twenty feet before she quit. As she turned, Danny and I were half way to meet her. Those sweet little boykin eyes got as big as saucers as she contemplated her options and decided the bumper was a better choice than the bank. She completed the retrieve to much clapping and praise, then I sent her out twice more to complete the session. Surely, we had this problem licked. The second weekend in May is a perfect example of the dichotomy that is our life in Nashville. Saturday features the Iroquois Steeplechase, a Nashville social tradition, and Sunday is the final day of the Music City HRC hunt test. It is a busy weekend - from hats and high heels to boots and camouflage. I’ve tried to convince my friends that camo is the new black, but they’re not buying that one. After a long day at the races, we were up early on Sunday and at the test grounds by 7:30AM. I checked-in Camden and Edie at the clubhouse for seasoned and followed the signs to the water test. 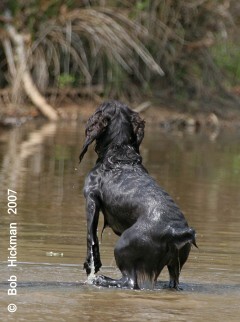 Middle Tennessee is in the midst of a drought and the ponds were scarcely filled with running water, even for a boykin. For the water double, the memory bird was thrown in shallow water, just 15 feet off the bank, and the path to the go bird led straight through Canadian goose decoys. The blind was run off the point of a levee, down to the water and up the bank on the far side for a land-water-land combination. With whistle and duck call in hand, I stepped to the line to see if my time in the pond with Camden was going to pay off. "Camden!" I called, in my most encouraging voice, as I sent her through the decoys for the first bird. She tore into the shallow water and scarcely glanced at the decoys that were twice her size. With the first retrieve behind us, I lined her up for the memory bird and sent her again. I had watched several dogs overrun the memory bird, get out of the water and search in vain once they had lost their bearings. Thankfully Camden was not one of them, and she completed the retrieve to the approving nods of the judges. One whistle later she had picked up the blind and it was on to land for the afternoon. Set on a rolling hill, the land series was going to be more of a challenge because Camden would disappear from view in the switch grass on her way to the marks and have to cross a gravel road on her way to the blind. The swing between the land marks was almost 180? and I would be pulling Camden with me for the go bird plus shooting a diversion on her return from the last mark. No matter how much you practice, it’s always a lot to think of at the line. "No matter how much you practice, it’s always a lot to think of at the line." The double wasn’t pretty. The memory bird was tough and I barely got the gun shouldered for the diversion, but Camden brought her birds back and we headed to the blind for the last bird of the day. The dirt road had been an obstacle for several of the dogs that day as it either slowed their forward momentum or they got a nose full of dust and had trouble finding the bird. "Dead. Dead Bird. BACK!" The results of all our months of yard work were evident as Camden lined the blind. With a "Pip. Pip. Pip." on my Acme 211 ½ British retriever whistle Camden returned and delivered the duck to hand. "Nice work, but you’re going to have to get a real whistle for that dog," said Kim Smith. I was just so pleased to get through the test that I didn’t try and explain my whistle preference to the crowd of duck hunters assembled at the line. "That second dog’s a lot easier to train," Kim concluded with a smile. Back at the clubhouse we awaited the judges decision. 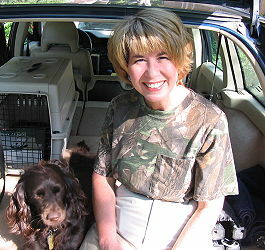 A pass for Edie would be our third together, and I would finally feel that it was ‘our’ Hunting Retriever title. A first pass for Camden would be a sweet ending to a long hunt test season that began in January. "Number 33, HR Just Ducky’s First Edition," called the judges. As I stepped forward to collect the day’s first seasoned ribbon, I overheard the murmuring of the crowd gathered around. "She told me this would be her third pass with Edie." "She got her title at Dixieland, but didn’t tell’em. Did we ever dunk her?" "If she wants that long, pretty title ribbon, she’s gonna have to get wet." After a hot day in the field a cool dunking was not an unpleasant prospect, so I dutifully took my seat. Unfortunately, I’d failed to notice that the first buckets were filled with the ice and water from the big coolers and a chunk of ice left me seeing stars. With title ribbon in hand, I took my seat and waited as they called the numbers and names of the other dogs earning a pass that day. I felt good about Camden’s performance, but as the stack of pink slips in the judges hands dwindled I began to have second thoughts. Did I handle her too much, or too soon, on that mark? Was I too obvious when I ‘scooped’ a bird before she dropped it? "Our final seasoned pass of the day goes to Number 35, Richland’s Camden Legacy, owned and handled by Anne Livingston." Anne Livingston comes from a background of involvment in schooling and horse shows. She loves the partnership formed with her animal and the camarderie of the people involved with training. Anne is director of marketing for a Nashville bank. 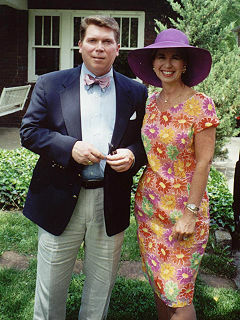 She and husband, Welch, have a three dog household: Claude, the standard poodle, and Edie and Cocoa, the Boykins. As a long-range goal, Anne plans to continue learning to train, raise quality Boykins and selectively place them in good hunting homes.